The subterranean architectural concept of the Carved House has brought passive building design concepts & principles to reality. With the facade facing southwest, an external shading system that overlaps the high-end glazing comes to action & in conjunction with various skylights & windows at the back-of-house open spaces allows us to actually control the daylight, ventilation, humidity & heating by natural means in order to output the best possible living conditions for residents at the lowest possible energy cost.The facade of the house is highly protected due to a layer of ETICS thermal insulation system. Floor to ceiling glazing in every room of the carved house allows for stunning views of the Aegean Sea without compromise including full sunset experiences. Entire parts of the plot have been left intact letting cavities of space between them that host the exterior spaces of the house. These inclined parts of land create viewing angles from inside & outside that are free of redundant information. Frameless sliding door units are fitted to every window with recessed profiles that allow for a flat-level flooring installation. 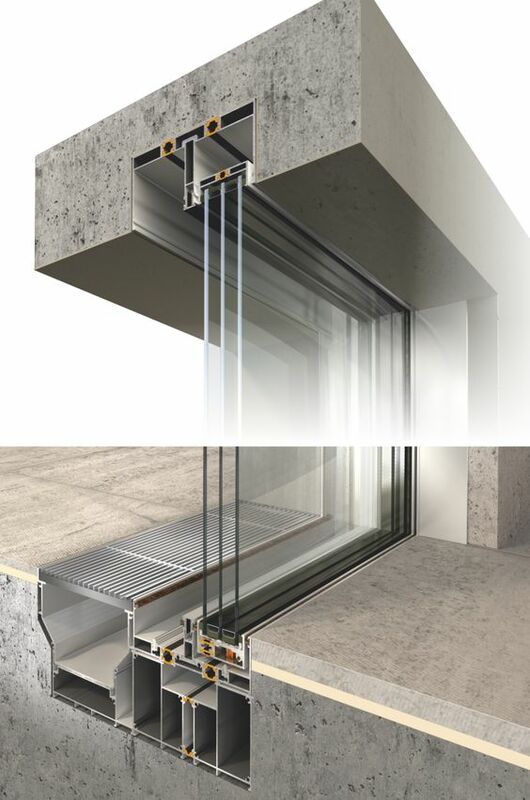 Glazing is a 26mm thick panel with double SEKURIT glass & 14mm ARGON air spacing. Earthy surfaces from stone-like materials, to rough coatings & raw wood can be found all over the house. Continuous use of the same material inside & outside creates an even better feeling of openness. High quality Italian ceramic tiles covers most of the house's flooring: the entire exterior space as well as the master bedroom & the living & dinning room inside the house. Three of the suite rooms feature both a cement coated flooring surface as well as raw wood boards. We have carefully designed each of the Carved House's bathroom spaces one by one to create unique & thematic experiences that only draw inspiration from the island's legacy & history but also honour the contemporary way of living & highest standards that the CH residents have been used to. Following different themes & patterns in each room, the Carved House is equipped with the latest bathroom equipment. Large cooking areas. Cellar room. The Carved House's boutique style open plan kitchen lets residents enjoy cooking & eating at a unified 50 sq.m. space that looks both at the front & at the back of the house emphasising on the essence of openness. Kitchen equipment is manufactured by one of the best brands, LEICHT with mechanical components & cupboard finishes of high end quality. The boutique style kitchen area extends to a second dedicated kitchen space suitable for preparation & cooking by the house's staff. Next to the kitchen area, a walk-in fridge, the wine cellar room is dedicated to host an exclusive collection of fine wines. Using autonomous ventilation & a "cellulator" engine it allows for optimum wine maintenance and lets the room work as one of the house's highlights. Smarter than ever: your concierge. The Carved House will have a full KNX smart home integration including the newest controls available. The branded Carved House App accessed via screens in several rooms allows the users to control the alarm & security system, enjoy different camera views around the property, turn the lights on & off and close the shades. Sensors in the glazing doors will give notice whether doors are open or closed. The Carved House App allows control of the heating & cooling. The entertainment system, in & outside speakers will be .... What has been exclusively developed & made available to the Carved House is the next smart home generation. Using powerful Artificial Intelligence algorithms the Carved House has its own soul. You can actually speak to the house's concierge waiting to receive any request from you. Speak directly to the concierge from every internal space of the house. Enable learning mode & let the concierge track all of your daily activities & habits over time in order to create your own profile & set everything up in the house exactly the way you would like to before you're event there. Making use of the flexibility that the smart home infrastructure offers & the latest Mitsubishi VRF technology, the Carved House offers a practically hidden system of climate control that can secure a high quality heating & ventilation result. The latest heat recovery technology is used in order to efficiently produce hot water for the residents at no extra energy consumption. Recessed & 5cm wide slots for airstream output are installed in every space of the house so that the clear & primitive aesthetics of the house interior are not compromised. Bathrooms are heated through independent electrically powered towel heaters of high end design. Besides the house's exemplary living, dinning & bed rooms there are also other types of rooms to support the advanced level of hospitality offered to its users. A dedicated hammam-shower space offers the ultimate relaxation during summer especially after exercising sessions that the users may have in the dedicated gym space. The home-theatre room is a 5 m x 5 m space that hosts a state-of-the-art home cinema installation with powerful sound system & a specially prepared projection surface. Carved House also features an open-air cinema space that seems to have formed naturally in one of the landscape's cavities.